Pyridoxamine dihydrochloride (Pyridorin, NephroGenex) inhibits formation of advanced glycation end products and scavenges reactive oxygen species and toxic carbonyls, but whether these actions translate into renoprotective effects is unknown. In this double-blind, randomized, placebo-controlled trial, we randomly assigned 317 patients with proteinuric type 2 diabetic nephropathy to twice-daily placebo; Pyridorin, 150 mg twice daily; or Pyridorin, 300 mg twice daily, for 52 weeks. At baseline, the mean age ± SD was 63.9±9.5 years, and the mean duration of diabetes was 17.6±8.5 years; the mean serum creatinine level was 2.2±0.6 mg/dl, and the mean protein-to-creatinine ratio was 2973±1932 mg/g. Regarding the primary end point, a statistically significant change in serum creatinine from baseline to 52 weeks was not evident in either Pyridorin group compared with placebo. However, analysis of covariance suggested that the magnitude of the treatment effect differed by baseline renal function. Among patients in the lowest tertile of baseline serum creatinine concentration, treatment with Pyridorin associated with a lower average change in serum creatinine concentration at 52 weeks (0.28, 0.07, and 0.14 mg/dl for placebo, Pyridorin 150 mg, and Pyridorin 300 mg, respectively; P=0.05 for either Pyridorin dose versus placebo); there was no evidence of a significant treatment effect in the middle or upper tertiles. In conclusion, this trial failed to detect an effect of Pyridorin on the progression of serum creatinine at 1 year, although it suggests that patients with less renal impairment might benefit. Approximately 40% of patients requiring renal replacement therapy have diabetes as their underlying diagnosis.1 Recent institution of therapeutic measures, which include blockade of the renin–angiotensin–aldosterone system and stringent control of systemic arterial blood pressure, has led to a significant slowing of the progression of the rate of loss of renal function in diabetic nephropathy.2 Consequently, according to the Centers for Disease Control and Prevention, the incidence of ESRD due to diabetes in the United States and Puerto Rico declined approximately 35% from 1996 to 2007. However, the prevalence of ESRD continues to increase because of the growing population of patients with type 2 diabetes mellitus.3 It is clear that new strategies designed to delay progression of diabetic nephropathy are required if further therapeutic progress is to be achieved. We conducted a clinical trial of pyridoxamine dihydrochloride (Pyridorin, NephroGenex), a metabolic derivative of pyridoxal phosphate (vitamin B6), to determine whether this agent can delay progression of diabetic kidney disease. Pyridorin is an efficient inhibitor of advanced glycation end products and glycoxidative reactions in various biologic systems.4–9 Further, Pyridorin is a chemical scavenger of pathogenic reactive carbonyl species and has been shown to inhibit formation of advanced lipoxidation end products during lipid peroxidation reactions.7,8 These biochemical characteristics suggest the possibility that Pyridorin may be a novel agent targeting several pathogenetic pathways that may be relevant to the progression of diabetic kidney disease. Several preclinical studies in rat models of diabetic nephropathy have demonstrated oral Pyridorin to be efficacious in preserving renal function.10–14 Two small, 24-week clinical safety trials have reported an apparent decrease in the rate of loss of renal function associated with Pyridorin treatment.15 The purpose of our study was to determine whether 1 year of therapy with Pyridorin delayed the progressive loss of renal function in patients with type 2 diabetes mellitus and advanced nephropathy. 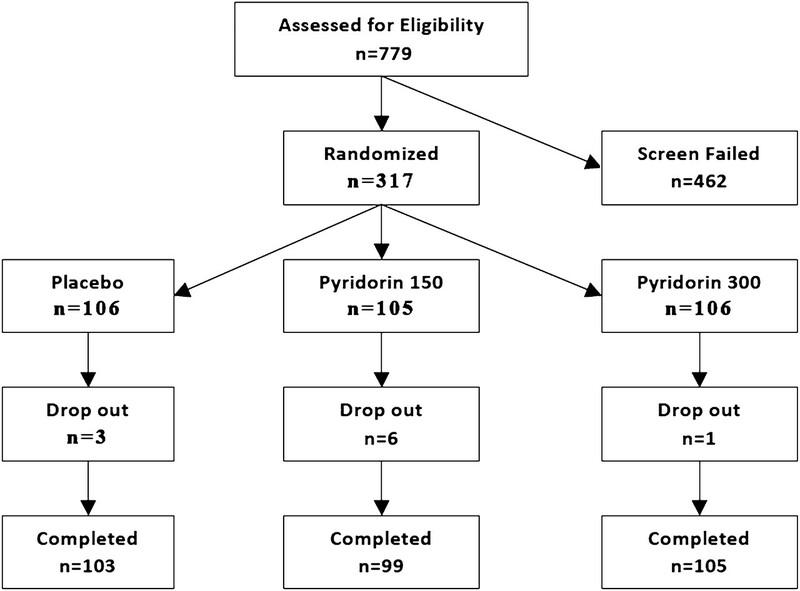 A total of 317 patients were randomly assigned and received coded medication: 106 to placebo; 105 to Pyridorin, 150 mg twice daily (PYR 150); and 106 to Pyridorin, 300 mg twice daily (PYR 300) (Figure 1). Baseline characteristics of the patients were balanced among the three study groups (Table 1). Mean values ± SD at study entry were as follows: serum creatinine concentration, 2.2±0.57 mg/dl; protein-to-creatinine ratio, 2973±1932 mg/g; and systolic/diastolic BP, 138±13/74±9 mmHg. BP was well controlled in all groups, and both systolic and diastolic BPs remained unchanged during the study. The average number of antihypertensive and diuretic agents was the same among the groups. Flow of patients through the study. Adherence was assessed at 1, 3, 6, 9, and 12 months; the adherence rate was 91% for 1585 patient visits. Treatment with angiotensin-converting enzyme inhibitors and angiotensin receptor blockers did not vary throughout the follow-up. Hemoglobin A1c values did not significantly differ among the groups. A total of 307 patients were followed to the 52-week termination. Table 2 shows the 1-year change from baseline serum creatinine concentration for all three groups. The change in serum creatinine concentration did not significantly differ for either treatment group: PYR 150 versus placebo, P=0.48; PYR 300 versus placebo, P=0.95; PYR 300 versus PYR 150, P=0.52). Analysis of covariance for treatment interaction with baseline serum creatinine concentration as a continuous variable revealed the following: PYR 150 versus placebo, P=0.006; PYR 300 versus placebo, P=0.01; PYR (both groups) versus placebo, P=0.002. Analysis was carried out according to whether the baseline serum creatinine concentration was ≤2 or >2 mg/dl (Table 2). Patients with a serum creatinine concentration ≤2 mg/dl receiving PYR 150 or PYR 300 had a diminished change from baseline compared with placebo. Among patients with a baseline serum creatinine concentration ≤2.0 mg/dl, the change in the placebo group was 0.28±0.55 mg/dl; in comparison, changes in the PYR groups were 0.13±0.32 mg/dl (P=0.10) for PYR 150 and 0.14±0.22 mg/dl (P=0.19) for PYR 300 (for PYR 150 plus PYR 300 versus placebo, P=0.09). The tertile distribution of baseline serum creatinine concentration at study entry involved 101 patients in the lowest tertile (<1.85 mg/dl), 106 patients in the middle tertile (1.86–2.43 mg/dl), and 100 patients in the highest tertile (>2.44 mg/dl). A significant treatment effect was demonstrated in the lowest serum creatinine tertile (1.3–1.85 mg/dl) (for both PYR groups versus placebo, P=0.046; Table 2). There were no significant PYR treatment effects in the middle (1.86–2.44; P=0.57) or upper (>2.44; P=0.10) serum creatinine tertiles. At 1 year, the differences in estimated GFR were as follows: PYR 150 versus placebo, 0.36 ml/min per 1.73 m2 (P=0.9); PYR 300 versus placebo, 0.31 ml/min per 1.73 m2 (P=1.0); and both PYR groups versus placebo, 0.34 ml/min per 1.73 m2 (P=0.9). Among patients in the lowest tertile of serum creatinine concentration, the differences in estimated GFR at 1 year were as follows: PYR 150 versus placebo, 3.8 ml/min per 1.73 m2 (P=0.03); PYR 300 versus placebo, 1.45 ml/min per 1.73 m2 (P=0.39); and both PYR groups versus placebo, 2.62 ml/min per 1.73 m2 (P=0.07). The intent-to-treat analysis showed no significant differences in changes in serum cystatin C levels: PYR 150 versus placebo, P=0.47; PYR 300 versus placebo, P=0.67. Examination of the effect of tertiles of baseline serum cystatin level on outcome did not reveal any significant decreases in the 1-year values relative to placebo. The protein-to-creatinine ratio was unaltered throughout the study. The baseline values were as follows: placebo, 2934±1805; PYR 150, 3015±1984; PYR 300, 2971±2007. The change in urine ratios after 12 months of therapy were 179±164 for placebo, 183±166 for PYR 150 (P=0.98 versus placebo); and −118±162 for PYR 300 (P=0.20 versus placebo). There was no treatment effect on the change in log protein-to-creatinine ratio according to tertile of baseline serum creatinine concentration. The Data Safety Management Committee did not find significant differences in adverse events or in severe adverse events during the study. Forty-nine severe adverse events occurred in the placebo group (46.7%), 41 occurred in the PYR 150 group (39.4%), and 42 occurred in the PYR 300 group (40%). Eight patients died during the study: two in the placebo group, five in the PYR 150 group, and one in the PYR 300 group. In no case was death believed to be related to coded medication. Our primary end point was the determination of the change in serum creatinine concentration in the intent-to-treat population studied. We conclude that Pyridorin failed to significantly alter the progressive increase in serum creatinine concentration that these patients experienced after 1 year of therapy. Two small, 24-week trials were previously conducted to determine the safety and tolerability of this agent in patients with diabetic nephropathy.15 Post hoc analyses of efficacy data from these trials suggested that the rate of increase in serum creatinine concentration was reduced among Pyridorin-treated patients; however, we were unable to confirm these findings. Previous clinical trials seeking to show benefit of a therapeutic agent in diabetic nephropathy did not use the 1-year follow-up protocol used in our study. The development of the protocol was based on evidence derived from the Irbesartan Diabetic Nephropathy Trial (IDNT), in which 579 patients in the irbesartan group were followed for approximately 3 years.2 By using data from irbesartan recipients who ultimately had progressive renal disease leading to the end points of halving of the GFR (doubling of serum creatinine concentration) or ESRD (attainment of a serum creatinine concentration ≥6 mg/dl, dialysis, or renal transplantation) during follow-up, we found that the mean increase in serum creatinine concentration after 1 year of follow-up was 0.24 mg/dl. Sample size was based on this expected increase in serum creatinine among our placebo group. Our study patients had advanced renal disease. The mean ± SD serum creatinine concentration at study entry was 2.2±0.57 mg/dl. Proteinuria in the nephrotic range was noted in a large proportion of our patients. Given the advanced nature of the renal disease in the study population and the implication of previous observations with pimagedine (a drug that also inhibited formation of glycation end products)—that patients with more intact renal function may be more responsive to therapy16—we placed into the protocol predefined secondary analyses that used tertiles of baseline serum creatinine concentration, as well as a comparison of performance of the group entering the study with a serum creatinine concentration ≤2mg/dl versus those with a concentration >2 mg/dl. We found that patients with the most intact renal function had slowing of the progressive loss of renal function, which reached statistical significance among patients in the lowest tertile of baseline serum creatinine concentration (Table 2). Of note, patients in the placebo group of the first serum creatinine concentration tertile had a mean increase of 0.28 mg/dl, essentially what had been predicted by the data from the IDNT. The significant result in the first tertile subgroup was not due to an unexpectedly high loss of renal function in the placebo group. Previous morphologic studies in type 1 and type 2 diabetic nephropathy have indicated that patients with a serum creatinine concentration in the 2-mg/dl range would be expected to have 50% or greater global glomerular sclerosis and associated advanced chronic interstitial fibrosis.17–20 It is therefore possible that patients in the upper two serum creatinine concentration tertiles in our study had advanced disease that at 1 year could be unresponsive to a drug that interrupts an early event in the pathogenetic mechanism of glomerular damage. Despite the positive preclinical experience, we failed to show that Pyridorin altered the progressive loss of renal function anticipated in our patient population. Predefined secondary analyses did reveal data suggesting that patients with less severe renal damage may have responded to the drug. We recognize that secondary analyses of subgroups can be misleading because the sample size is smaller and the observations are underpowered. Experience leads one to be circumspect about subgroup observations. However, analysis of covariance of the interaction of treatment effect with baseline serum creatinine concentration as a continuous variable was highly significant (P=0.006). The results of subgroup analysis therefore cannot be entirely overlooked. We must consider the possibility that patients who had the most intact renal function may have achieved the desired therapeutic result. In view of our findings, a properly powered study of this latter subpopulation of patients is required. Eligible participants were men and women 25 years of age or older with a diagnosis of type 2 diabetes according to the American Diabetes Association definition. Participants were required to have a serum creatinine concentration of 1.3–3.3 (women) or 1.5–3.5 mg/dl (men) inclusive and a 24-hour urine protein-to-creatinine ratio of ≥1200 mg/g while receiving an angiotensin-converting enzyme inhibitor or angiotensin receptor blocker at the maximum Food and Drug Administration–recommended dosage for ≥3 months before the qualifying visit. Stable antihypertensive therapy was required for 2 months before the qualifying visit, with seated systolic pressure <160 mmHg and diastolic pressure <90 mmHg and a goal of ≤130/80 mmHg. A 3-month optional run-in period was required for patients starting angiotensin-converting enzyme inhibitor or angiotensin receptor blocker therapy, requiring a significant change in dose or discontinuing angiotensin-converting enzyme inhibitor or angiotensin receptor blocker if they had been receiving both classes of drug (2-month run-in for the latter). Any change in hypertensive therapy required to attain optimal control required entry into the optional run-in period. Patients who met the serum creatinine and protein-to-creatinine ratio inclusion criteria initially or after the run-in period were randomly assigned to Pyridorin, 150 mg twice daily; Pyridorin, 300 mg twice daily; or placebo twice daily at a 1:1:1 ratio using an interactive voice response system. The study was 52 weeks (12 months) in duration. Clinic visits were held at months 1, 3, 6, 9, and 12 (week 51). Efficacy and safety measures were evaluated at each follow-up visit. If a patient required dialysis, the study drug was discontinued. If ESRD occurred, blood and urine collections were obtained from the patient’s local clinic when possible. Serum creatinine concentration was measured centrally at the qualifying visit, at randomization, and at months 1, 3, 6, 9, and 12. The serum creatinine concentration was determined using the Jaffe reaction (Hitachi analyzer, Roche, Montclair, NJ). Urine protein-to-creatinine concentration was measured at each clinic visit, as was serum cystatin level. Office BP was measured by using a sphygmomanometer or automated BP device in the sitting position after 10-minute rest. Three seated BP values were obtained 1 minute apart and averaged for the BP of record. The primary outcome of the study was therapeutic success, defined as a statistically significant difference in the mean change in serum creatinine concentration from baseline to the 12-month end point across the three treatment groups for at least one Pyridorin treatment group versus the placebo group at an α = 0.05 level of significance. Change in serum creatinine concentration was determined using an analysis of covariance model, with treatment group as a factor and baseline serum creatinine concentration as a covariate. The Dumett test was used to compare each Pyridorin treatment group with placebo, with maintenance of the significance level at α=0.05. Least-squares means and 95% confidence intervals for differences between treatment groups were determined. Predetermined secondary analyses included efficacy analysis of patients according to an analysis of patients with a serum creatinine concentration ≤2 mg/dl and a serum creatinine concentration >2 mg/dl and tertiles of baseline serum creatinine concentration. The mean change in serum creatinine concentration for the two Pyridorin groups was compared with that in the placebo group. The sample size estimate for this study was determined using data from previous Pyridorin studies (PYR 206, PYR 205/207) and the IDNT.2,15 Data from patients with clinical characteristics equivalent to the entry criteria for our study were used. In accord with these data, a difference in mean change from baseline to end-point serum creatinine concentration would be expected to average 0.24 mg/dl, with a common SD of 0.60. The study was powered to detect a 40% difference between the Pyridorin groups and placebo. The sample size of 100 patients per treatment group provided >80% power to detect the expected difference in change in serum creatinine concentration with a two-sided type 1 error of 0.05. Safety analyses included adverse events in the following categories: vital signs, electrocardiograms, safety laboratory measures (clinical chemistry and hematologic values), and physical examination findings. The safety analysis was based on the frequency or worsening of adverse events, laboratory abnormalities, and serious adverse events. Adverse events were coded using the Medical Dictionary for Regulatory Activities and were summarized by treatment group, systemic organ class, and preferred term. An independent Data Safety Monitoring Committee included two nephrologists, a statistician, and an ethicist. The committee met at the beginning of the study and twice during the study. The first patient was randomly assigned on August 4, 2008, and the last patient was randomly assigned on July 31, 2009; the last patient visit was on August 17, 2010. E.J.L, J.B.L., and T.G. received salaries from research grants from NephroGenex. This study was funded by Nephrogenex Inc.
See related editorial, “Pyridoxamine, Advanced Glycation Inhibition, and Diabetic Nephropathy,” on pages 6–8. This article contains supplemental material online at http://jasn.asnjournals.org/lookup/suppl/doi:10.1681/ASN.2011030272/-/DCSupplemental. Centers for Disease Control and Prevention: Incidence of end-stage renal disease attributed to diabetes among persons with diagnosed diabetes—United States and Puerto Rico, 1996-2007. MMWR Morb Mortal Wkly Rep 2010;59:1361–1366.